It was only a matter of time before we got a chef’s notebook durable enough for the kitchen. Actually, it’s about time. Stone, a chef’s notebook, was made by industry professionals who’ve worked collectively in dozens of restaurants around the world. Not only that, it was developed with the input of over 40 Michelin starred chefs throughout the US, UK, Spain, Japan and Australia. Their main goal was to design a notebook to withstand all of the elements in a grueling hot kitchen, but it was also very important that it look good while doing it. The Stone chef’s notebook is made up of 7 key features, all carefully considered, designed and implemented. Made with stone paper and vegan leather, both combine to make this notebook immortal in the kitchen. Perhaps our favorite part of this chef’s notebook is the conversion charts at the back of the book. Weight, volume, temperature, liquid and sugar conversion at your fingertips. This is crucial when you’re moving around quickly in the kitchen. No chef wants their notebook to close on them when they need to quickly double-check a measurement or ingredient. Another awesome feature that lets you tear out menus or recipes cleanly. All chefs know this is a MUST! Honestly, magnets make everything better it’s just fact. The Stone chef’s notebook has two. Both hidden benaeath each side of the cover. A back inside pocket that’s perfect to slide a recipe or notes into. Aside from all of the cool features above, the notebook’s cover is a standout piece in itself. Made from vegan leather and coming in three different colors – tan brown, black and vermilion red. Along with the three classic colors, there are a number of other options available including monogrammed initials, a leather cover and the Stone Set box. If you are a brand or business you can also customize the cover of your Stone with a logo or emblem. 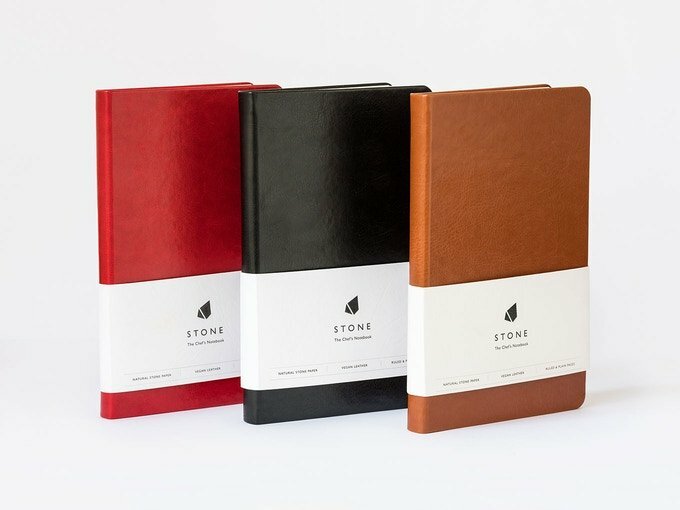 The Stone Chef’s Notebook has already blown past it’s Kickstarter goal, so we know it’s definitely going into production. If you too are intrigued back the project right here.